Tiger Woods and Phil Mickelson, two of golf’s most decorated legends, will go head-to-head in a post-Thanksgiving matchplay challenge in Las Vegas for a $9 million cash prize. As the PGA’s most recognizable active golfers of the last few decades, Woods and Mickelson have spent a significant amount of time at or near the top of the World Golf Rankings, and the talent and entertainment value that each possesses will make this a can’t-miss, made-for-TV event. This is not a PGA Tour-sanctioned event, but rather an exhibition offseason match between two golfing greats. Here is everything to know about how to watch “The Match,” including the cost of pay-per-view, betting odds and the unique matchplay format. When do Tiger Woods, Phil Mickelson tee off? Tigers vs. Phil will take place at 3 p.m. ET on Nov. 23, 2018 (noon local time). Where is ‘The Match’ being played? Shadow Creek Gold Course in Las Vegas will host the event. The private course was recently ranked as the No. 26 overall golf course in the United States by Golf Digest. How do I watch Tiger vs. Phil? There are a variety of ways to watch “The Match.” It can be seen on pay-per-view through B/R Live, DirecTV, and AT&T U-Verse. The pay-per-view will also be sent to several other cable outlets such as Comcast and Verizon. How much does ‘The Match’ cost on pay-per-view? The event will cost $19.99 through the various pay-per-view options. Tiger Woods opened as a -200 betting favorite, according to BetOnline.com, with Mickelson as a +170 underdog. There are also plenty of prop bets to indulge, including the color of shirt worn by both Woods and Mickelson, and a stroke spread favoring Woods at -1.5. The basic premise will be match play, which awards a point to a golfer when they win a hole. 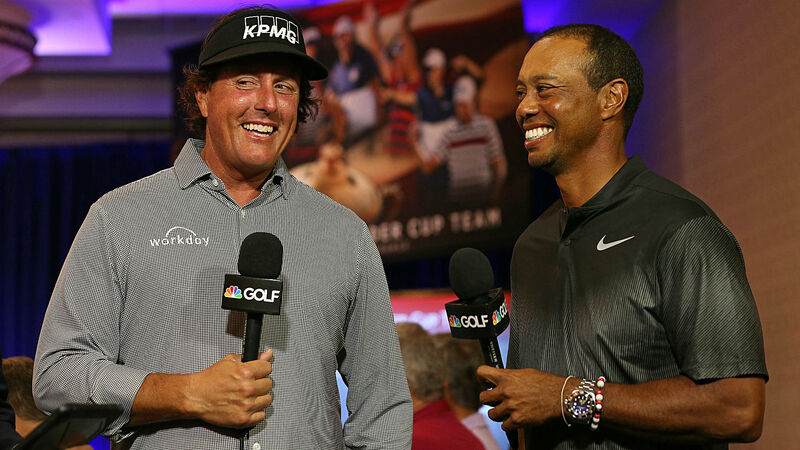 According to a release from Turner Media, Woods and Mickelson will be able to challenge each other competitions at various points during the match, including longest drive and closest-to-the-pin contests.